The leader of the Indigenous People of Biafra (IPOB), Nnamdi Kanu, has been warned off Lagos state by Igbo residents in the state. 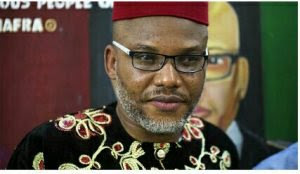 The warning was given by the leaders of Igbo traders who said they do not want to seen to be supporting his cause. In a chat with Sunday Telegraph, the chairman of the Alaba Amalgamated Traders Association, Chiemaka Ibeh, the Igbo leaders said they are not in support of his message, his planned visit and urged him to leave Igbos in Lagos alone. He said,“He (Kanu) should keep his Biafra in the East where our unemployed youths are following him all over the place, not knowing what they are dabbling into. “Most of these youth do not understand what Biafra is about and what it has cost Igbo people. “Since his actions led to the quit notice by the Arewa youths, I expected Kanu to have paid upfront all transport companies on the northern route to be conveying Igbo people who might be interested in coming back to the East, but he has not paid a kobo to anybody. “Is he bothered about the economic well-being of the people whom his actions could dislocate?” Ibeh queried.